Are you (or your customers) a small or mid-size make-to-order manufacturer? Do you use Microsoft Dynamics 365 Business Central as your ERP system or are you thinking about using it? In both cases you might have already noticed that while the manufacturing module of Dynamics 365 Business Central Premium is quite a bit oversized for your purposes, the Essentials package lacks essential production planning functionality matching the requirements of your business. So far, you haven't found a satisfying solution to this problem? So let me help you further by showing you how easily this dilemma can be solved by using our cloud-based software just plan it for visual production scheduling tailored especially towards small and mid-size make-to-order manufacturers. Why enhance Dynamics Business Central at all? As user of Dynamics 365 Business Central you certainly know your ERP system as powerful all-in-one business management solution that's easy to use and adapt, helping you to connect your business and make smarter decisions. So perhaps you are asking yourself now why you should subscribe to another software. As I mentioned above, the manufacturing functionality of Dynamics Business Central Premium does not seem to be tailored towards the scheduling requirements of volatile high-mix low-volume producers such as job shops and machine shops, whereas all other standard Business Central functions are ideal for these type of companies. If you decided for the Essentials package, you certainly get easy management of commercial business processes, like quotes, orders, invoices. However, Essentials does not include a production planning functionality matching the requirements of make-to-order manufacturers so that important information such as overview of delivery dates, utilization and usage of resources and production status is missing. This is where we come in - let us help close the gap and add production scheduling functionality to your Dynamics Business Essentials by our scheduling software just plan it. What is just plan it? 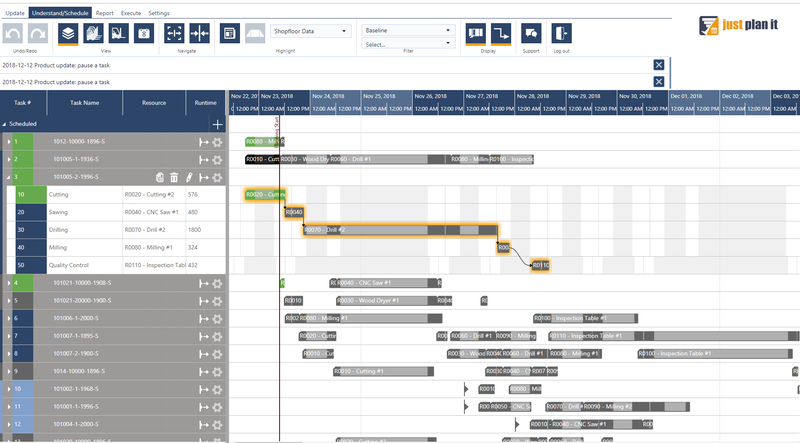 just plan it is an easy time and resource scheduling software that was made with a clear focus on small make-to-order manufacturers such as job shops and machine shops. It is a visual scheduling application built for production planners and owners of small businesses allowing easy-to-understand drag & drop changes of the schedule. Moreover just plan it also allows bringing execution (i.e. "live" shopfloor data) into the schedule and hence running the shop with an always current schedule. So if by now you got convinced and are tending to give just plan it a try for bringing production scheduling functionality to your Dynamics Business Central, there is certainly one question left before you get going: How will the connection between the ERP system and just plan it be established in practice? Let me tell you: nothing will be easier! To connect Dynamics Business Essentials and just plan it we have landed our latest coup: The free add-on app just plan it 365 being available on AppSource. The app was designed for Dynamics 365 Business Central Essentials especially and integrates just plan it with Business Central, enabling you to automatically create production orders in just plan it from items that you add to a sales order/ quote in Business Central. The app provides you with "production finish" information on the fly, thus bringing production scheduling to Business Central Essentials. The video below vividly shows how easily the just plan it app integrates just plan it with Business Central and how comfortable managing your schedule will get once the connection is established. A Business Central Essentials account. A just plan it PRO account. If you do not have a just plan it account yet, go ahead and create a trial account. Click here if you want to know more about the pricing model of just plan it. And, of course, just plan it 365, available on AppSource. Read more about how just plan it 365 brings production scheduling to your BC system. Read the detailed step-by-step guide for connecting Microsoft Business Central with just plan it on the comprehensive product website. Follow the just plan it blog.